This cozy corner unit is located on the first floor and has a queen bed, two person double shower bathroom and gas fireplace. It has a breathtaking view from the deck. The view is overlooking the coastal range valley and our Natasha, Bailey, and Jordan vineyards. This cozy corner unit is located on the second floor and comes with a gas fireplace, Queen bed, & two person double shower bathroom. It overlooks the stunning coastal valley, Natasha, Jordan & Bailey Block vineyards, as well as the western forest. This second-floor room comes with a bay-window, Queen bed, fireplace, and two person double shower bathroom. It is located on the second floor overlooking the stunning valley, and the Natasha & Bailey Block vineyards. Enjoy the sunrise and sunset in this newly renovated corner room on the second floor. It comes with a king bed, gas fireplace & two person double shower bathroom. It is located on the second floor overlooking the stunning valley, Natasha, Aspen, & Bailey Block vineyards, as well as Mt. Jefferson. This beautiful King Suite has just gone thru a total renovation. Everything is new from the seven windows offering a panoramic view, sitting area, & private bathroom with air jacuzzi, wine sink double vanity, and double rain shower. The suite is located on the second floor overlooking the stunning valley, Natasha & Aspen Block vineyards as well as Mt. Jefferson and Mt. Hood. A panoramic view that will take your breath away. Our ‘Master’ Suite is stunning with a king size bed, private balcony, separate sitting area, fireplace, jacuzzi, & shower. 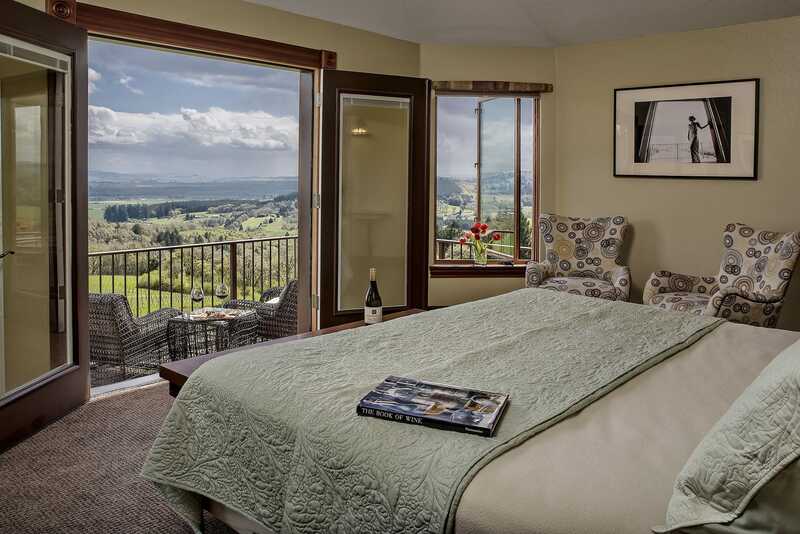 It is located on the second floor overlooking the stunning Willamette & Coastal Valley, Natasha & Aspen Block vineyards, northern forest, and Mt. Jefferson and Mt. Hood. Breathtaking no matter which direction! Panoramic view overlooking the vineyard, valley, Mt. Jefferson and Mt. Hood. A lovely two-room King Suite is complete with a separate sitting area, private balcony, queen sleeper sofa, and corner shower. It is located on the second floor overlooking the northern forest and Jordan Block vineyard. Views overlooking the vineyard and forest. This lower level King Suite is large and comes with look out windows and shower. This room doesn’t have the grand views the other Inn rooms do but the first floor has common areas to relax in and a full wrap around deck to enjoy with many relaxing areas. Old world ambiance meets modern luxuries at Youngberg Hill. Our bed and breakfast is surrounded by a naturally romantic landscape, offering a one-of-a-kind lodging experience in Oregon wine country. The expansive veranda and in-room comforts like fireplaces and deluxe air jet bathtubs make each stay a relaxing retreat. The spacious house features nine different lodging options including king suites and luxuriously appointed guest rooms with queen beds. All rooms have private baths and comfortable chairs to relax in where you can take in spectacular views. Each room is also provided with luggage racks, iron and ironing board, blow dryer and spa robes. The entire inn is set with complimentary WIFI. We are happy to provide complementary concierge service to guests staying at our McMinnville bed and breakfast. Helping you tailor your visit to match what you want is our specialty. When making your reservation please ask for our assistance in arranging all your wine country activities and reservations. We love to help make sure your entire visit to the area is just right. Wine Tastings available by appointment. Inn guests receive a $15 discount on the wine tasting. All rooms come with a full gourmet breakfast each morning. For private group events a continental breakfast is offered. Children over 8 are welcome. Whole house reservation doesn’t have a min. age requirement. Anyone under 21 years of age needs parental supervision at all times. No overnight pets on the property or in vehicles. If you’re coming for an event or a wine tasting, dogs are welcome on the deck outside our tasting room as long as they are leashed and supervised at all times. We have our two vineyard dogs that are often hanging around. No pets are allowed inside buildings. Rates are for one or two persons. $25 for each additional person. One nights lodging as a deposit. Entire Inn booking & private events are subject to an additional 10-20% service charge. EV (Electric Vehicle) and Tesla charging station available. 30-day cancellation. Multiple room reservations require 90-day cancellation notice. A $10/room service fee will be added to all cancellations.